You may have heard of Legionnaires Disease, but you may not realise how serious this disease can be. Legionnaires Disease is a serious type of pneumonia caused by bacteria called Legionella. If you handle soil in bags or are a gardener there are some risks you should be aware of. The most common way people are infected is by breathing in bacteria-contaminated dust or liquid. Legionella is an environmental organism that lives in moist conditions, but it breeds in temperatures between 20-40 degrees. Don’t be complacent, simple safety procedures should be used to reduce exposure. What can you do to avoid contracting Legionnaires Disease? What many don’t realise is that you can contract Legionnaires Disease from your garden as well as brought potting mix/compost. Here are some top tips to reduce your chance of infection. Read all warnings on bags of soil before use. Only purchase what potting mix/compost you need; this is to avoid the soil drying out and the possibility of breathing dust particles when eventually opening the bag. If storing bags of soil, keep them out of direct sunlight. To avoid dust particles wear a dust mask when opening bags of soil, repotting plants or gardening. If you are using a reusable mask, this must always be stored between uses in a sealed bag and removed with clean hands. Wear gloves when handling any soil, both bagged or garden soil. When opening bags of soil, always open bags outside, never in a garage or in an enclosed space. Open bags of soil slowly, directing the opening away from the face to avoid inhaling the mix. If soil in the bag or the garden is dry, water it gently before use to avoid dust particles. 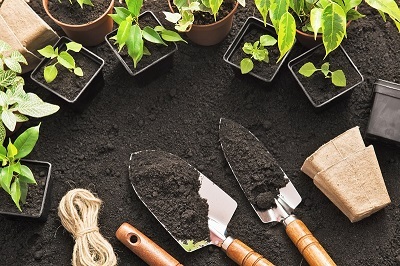 When potting plants, planting or cultivating gardens, ensure soil is wet to reduce dust. Water gardens and compost gently, using a low-pressure hose. Always wash hands after handling soil and before eating, drinking, smoking or placing hands near the face. When working in a greenhouse, potting shed or indoors with soil, make sure your space is well ventilated. If you develop a flu-like illness that is worsening, see your doctor immediately. Antibiotics are very effective against Legionnaires Disease if given early.